Note: Since RelativityOne versions are deployed to locations at different times, verify the Relativity version you are on when choosing what Case Dynamics version to install. Beginning in July 2018, you can toggle the UTC conversion on/off. The UTC toggle is controlled by a Relativity script that updates the UTC state in one or all workspaces where Case Dynamics is installed. Note: The UTC conversion will only be visible in custom pages with inline lists, such as the Timeline Builder or when viewing Case Dynamics items. Go to the Relativity Script Library. Locate and open Case Dynamics - Convert UTC format. A pop-up appears. Select a single workspace or all workspaces. True - turns the UTC toggle on. False - turns the UTC toggle off. Note: The UTC toggle is set to False as a default. 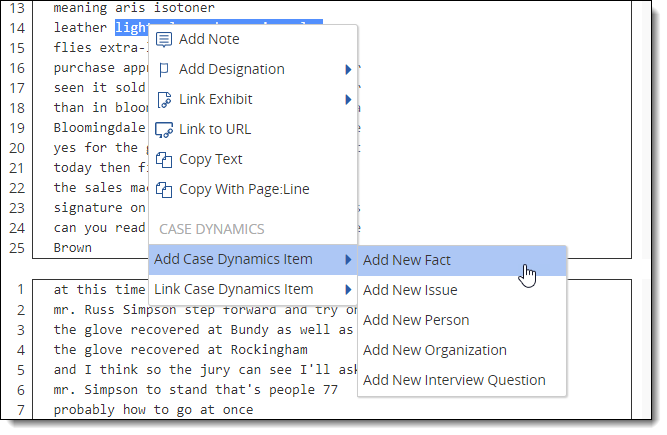 When reviewing documents, you can use the Case Dynamics coding pane to create and link Case Dynamics items. Click in the coding layout to access the coding pane. You can also access this functionality from the Transcripts layout when working with transcripts in the Transcripts application. For more information, see Transcripts application. Note: To use the coding pane, you must have the Case Dynamics - coding pane security permission assigned. Without this permission, you can only view the coding pane and cannot make edits. On every tab of the Case Dynamics coding pane, you can search for items in the filter box and sort items alphabetically by clicking . By default, items appear in descending alphabetical order, and the arrow on the icon points down. To sort in ascending alphabetical order, click the icon. The arrow on the icon points up when items are sorted in ascending alphabetical order. Highlight text in the document, right click, and then select Add Case Dynamics Item. In the following image, the user is highlighting text on a transcript to add a Case Dynamics item. Click in the coding pane. You can then fill out the details for the new item in the corresponding pop-up window. Items are automatically linked to the document, and you can choose to link to a description, excerpt, or comment by editing the item. Check the applicable boxes under All Facts in the coding pane and click Save. Highlight text in the document, right click, and then select Link Case Dynamics Item. Use this method to link items one at a time. Make sure to click Save. You can also link items from the Full Details link found along the bottom of the coding pane. The Full Details pop-up window provides more information on linked and available items. A pop-up appears. Select items in the Available Items section. Primary Fact Date - Denotes the date when the fact occurred, or the start date for an event that occurred between certain dates. Beginning on June 30,2018, you can also select a specific time. End Date - Records the completion of a fact that took place over a period of greater than one day. Beginning on June 30,2018, you can also select a specific time. - Organize by Time. Select this mode to organize facts on the timeline by time. You can select this mode beginning on June 30, 2018. - Organize by Date. 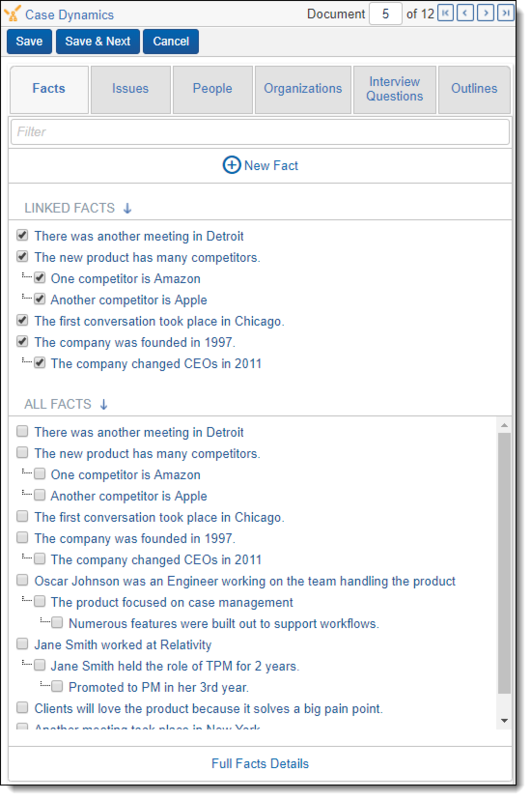 Select this mode to organize facts on the timeline by date. You can select this mode beginning on June 30, 2018. Beginning on June 30, 2018, new visual cues exist.To clearly present facts in between dates, these facts appear on a timeline connected by three dots. These facts also appear between two arrows on the timeline and are highlighted in a yellow color when selected. Beginning on February 3, 2018, you can edit a locked outline. Beginning on February 3, 2018, you can set up a saved font color and style for users. Beginning on May 28, 2018, you can edit the view when linking to documents.